Often considered a completely barren region, the Hordelands features sparse vegetation, rare oases, and the quarreling tribes of the Tuigan. These horse-riding nomads are best known for their invasion of Faerûn more than a decade ago. Fierce riders expert with their composite shortbows, the nomads are divided among at least ten tribes, living in tents and surviving on meat and milk. Their few permanent settlements center around oases, for water is their most precious commodity. The superstitious local people are distrustful of strangers, especially after their defeat by the western armies. It will be at least a generation before the Tuigan again pose a significant threat to Faerûn. Dismissed as an inconsequential for years, the Hordelands now see increased trade activity between Faerûn and the Kara-Turan empire of Shou Lung far to the east. Traders carry exotic goods to and from each locale, making many rich along the way. Life in the Hordelands is harsh, with cold winters, hot summers, poor soil unsuitable for farming, and frequent violent storms. The nomads are forced to wander to survive, letting their tough steppe ponies forage on the sparse vegetation. and feeding themselves on livestock, horse milk, and the creatures of the Endless Waste (only part of the vast Hordelands). The Tuigan culture is egalitarian, with children of both sexes trained to ride and use the bow, although men are expected to become warriors while women assume a powerful role in the household. Small dwarven settlements dot the slopes of the Sunrise Mountains, but the two races avoid each other due to language and cultural barriers. The great feature of the Hordelands is really a lack of features at all. The Endless Waste and the regions beyond are flat steppelands, shading toward tundra on the northern flank and cold, rocky desert to the south. The land is scoured by fiercely cold winds blowing off the Great Ice Sea in the wintertime, and blasted by dry furnace heat and billowing duststorms in the summer. The great herds of grazing animals represent the wealth of the land, a resource of food, clothing, and shelter that the Tuigan follow from one end of the land to the other in a perpetual migration, season after season. North of the Endless Waste lies the Great Ice Sea, known to the Tuigan as Yal Tengri. This body of water is frigid and icebound in the winter, inhabited by cold-loving creatures and a wealth of fish and marine life. Though it clears of ice in the summer, in springtime icebergs dot its surface, some of them moving about contrary to winds and currents. The Endless Waste features no permanent cities, few ruins, and even fewer settlements or centers of civilization. The roaming camps of the barbaric Tuigan are the closest thing to civilization that this region knows. The Dragonwall: Too far east to be seen on Faerûnian maps, past the enormous Quoya Desert, this lengthy wall of brick and stone was built by the Shou to protect their western border. The spirit of a mighty dragon acts as its mortar, and nonmagical weapons do not harm it. The dragon was tricked into this service and can be freed a section at a time with the proper sacrifice. Any communication magic enables talk with the dragon, who gladly tells how to free it. When it pulls itself free, the wall crumbles in that area and the Shou must rebuild it with mundane materials. 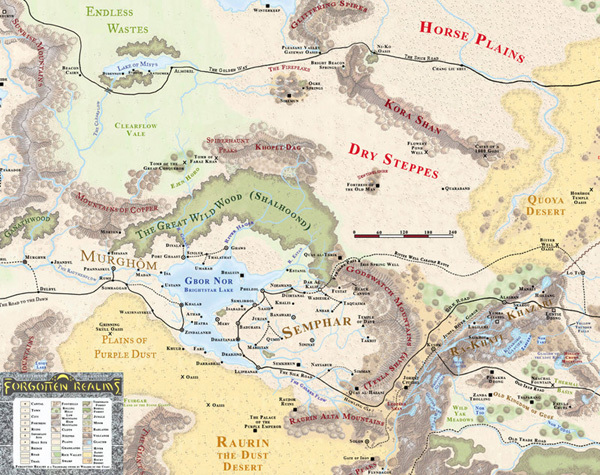 The Golden Way: Perhaps the most famous of Faerûn's trade routes, the Golden Way runs from the city of Telflamm on the Easting Reach, through Thesk and Rashemen around the Sunrise Mountains, and then across the Hordelands all the way to Shou Lung. While there is little need for a road or even a beaten trail in the steppes, the Golden Way is marked by a series of encampments and caravanserai providing safe haven and shelter for those merchants who dare the months-long journey. Winterkeep: This ruin shows little on the surface but cracked pillars and stacks of stone. Once the winter palace of Raumatharan kings, its underground levels are richly appointed, and rumors tell of hidden treasure vaults, armories, and granaries. It is not known what remains, as no one has made an extensive exploration of its interior. Thousands of years ago, this area was once part of the Imaskar empire, ruled by powerful wizards. Since that time a succession of great empires have claimed the Hordelands, including Mulhorand, Raumatkar, and Shou Lung. Few of these claims meant much, for none bothered to settle or fortify the area. For centuries now the Endless Waste has been ignored by other nations, leaving the Tuigan nomads to do as they wish in their native land, which they call Taari. After the Time of Troubles, an ambitious Tuigan noble named Yamun killed his father to assume leadership of his tribe. With charisma, force, and strategy, he united the tribes of the Endless Waste and formed them into an army three hundred thousand strong, claiming the title Yamun Kh'ahan. The great chieftain invaded Faerûn and Kara-Tur in 1360 DR. The horde fought against Rashemen, Thay, and Thesk, and was finally stopped later that year by an alliance of Faerûnian powers including Cormyr, Zhent orcs, dwarves from the Earthfast Mountains, Sembian mercenaries, and Dalesfolk. Reduced to less than seventy thousand capable warriors, the Tuigan people returned to the Taan to lick their wounds and rebuild their strength. This history of the Endless Waste weaves a complex tapestry of barbarism, war, and deadly conquest. Long before the united nomads under Yamun Khahan emerged from their ancestral steppes seeking conquest, the Hordelands were a place where great empires and fiendish armies once held sway. Even today, the impact of those ancient forces and many others still shape the lives of all who call the Hordelands home. -11909 Dwarves settle the Firepeak Mountains. -8900 Tribes of Taangan (Tuigan) humans settle the Endless Waste. -8350 Imaskari tribes settle the Raurin Plains. -7891 Zexthandrim conquered by Imaskari forces. -7403 Zexthandrim rebels against Imaskari rule and is destroyed. -7100 Imaskari Empire subjugates Taangan tribes and demands semi-annual tribute. -5000 A suspicious plague decimates Imaskar, then spreads to the Endless Waste. -3149 With a large influx of gnome refugees arriving, Songfarla is officially founded. -2488 Imaskar Empire destroyed by former slaves. -900 realm of Raumathar is founded with its capital at Winterkeep. -280 Year of Impudent Kin Raumathari found Almorel. -160 Year of Stone Giant Raumathar and Narfell destroy each other in a decade-long war that pits arcane magic against fiendish forces. Fleeing from this war, river spirit folk settle the Lake of Mists. -150 Year of Recompense Barbarians drive Raumathari survivors from much of the Hordelands. 305 Year of Barrows Orcs from the Sunrise Mountains descend on the Lake of Mists but are driven off. Rise of Yamun Khahan. 1358 Year of Shadows Time of Troubles. Tuigan Horselord Yamun Khahan unites the barbarian tribes of the Hordelands. 1359 Year of Serpent Tuigan army conquers Semphar and Khazari, and then invades Shou Lung, Thay, and Rashemen. Citadel Rashemar is destroyed. 1360 Year of Turret Tuigan forces invade Thesk. Allied armies from the Western Heartiands defeat the Tuigan. King Azoun IV of Cormyr slays Yamun Khahan. 1361 Year of Maidens Tuigan bandits in Thesk terrorize merchants on the Golden Way. 1363 Year of Wyvern Hubadai, son of Yamun Khahan, declares himself khahan and founds the nation of Yaïmmunahar. 1365 Year of Sword Red Wizards of Thay melt glaciers in the Icerim Mountains prior to an invasion of Rashemen, flooding the northwestern steppes of the Endless Waste. 1367 Year of Shield Kourmira, capital of Yaïmmunahar, founded. 1369 Year of Gauntlet Increased trade along the Golden Way prompts western nations to establish trading outposts in Almorel and Kourmira. 1374 Year of Lightning Storms Red Wizards open a merchant enclave in Kourmira. For most people, simply surviving a few days of travel across the Hordelands is an adventure, albeit a boring, exhausting, and miserable one. City of the Dead: A ruined city has been discovered in the wastes. The nomads avoid it, citing evil spirits and many curses, but those on the caravan route from Kara-Tur say the city holds magic and treasure from Netheril, Rauniathar, or Imaskar itself. The ruins are pushing themselves upward from the ground, as if rebuilding themselves for their old inhabitants. The Tuigan Scouts: A new leader among the nomads seeks information about the lands to the west and has been sending eager young ones on journeys of knowledge. These travelers avoid Thay and Rashemen, entering through Narfell to the inner Sea, where they study everyone they meet, bring back interesting items and found valuables, and (some say) avenge the death of Yamun by assassinating one noble or influential person in Cormyr. These last rumors are again turning public opinion against the Tuigan, even though they have caused no trouble for more than ten years.